With a choice of period offices with original features this business centre provides contemporary open plan spaces, meeting rooms and conference facilities with great access to the motorway network. 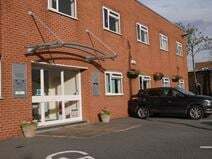 Conveniently located just off the A1M, this period property is home to our serviced office centre, which delivers high-tech IT infrastructure and excellemt support services. This is attractive setting for your business. With easy access to the motorway network, this centre offers a range of serviced offices, along with excellent facilities including suspended ceilings, perimeter trunking and car parking. Available now on flexible terms.